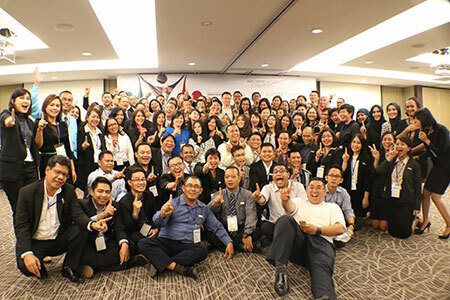 Jakarta, June 7th 2016 - Archipelago International, Indonesia’s largest hotel management group, recently gathered all of its Human Resources (HR) hotel representatives across Indonesia and Malaysia for its 8th HR Forum. Held at the Aston Sentul Lake Resort and Conference Center, the newest conference center in Sentul, Archipelago International's Corporate HR team worked together with its hotel teams on a fun and informative HR workshop. The workshop was held alongside the one-day Archipelago International Job Fair, which provided hundreds of job opportunities across Indonesia and Malaysia. The opportunities ranged from front of house to back of house positions, both in the Hotel Units and Corporate Office. Besides applying for opportunities within existing hotels, jobseekers also got a chance to become part of the pre-opening teams for upcoming hotels. During the job fair, the participants also uploaded hundreds of photos to their Instagram accounts using the hashtags #ArchipelagoJobFair, #ArchipelagoHREvent, and #ArchipelagoInternational. Archipelago International also incorporated its Corporate Social Responsibility (CSR) into the annual forum. This year’s CSR focused on environmental preservation, and as such, all participants gathered for a small hike through Taman Nasional Gunung Gede Pangrango to learn more about the biodiversity in Indonesia and how to preserve the natural environment. "We are always committed to giving back to society,” said Lukas Samali, VP of Human Resources of Archipelago International. “This year we helped Taman Nasional Gunung Gede Pangrango with basic necessities such as canopies, palanquin, and hiking guidance posters which will be useful for both visitors and caretakers. Besides educating people on the importance of nature preservation, we hope that our hotel representatives will be inspired and motivated to hold future CSR events in their respective areas," Lukas concluded.